We had a visit from Claremont Police department explaining the importance of children being aware of their surroundings and the dangers that may be out there. Unfortunately in this day and age there are real dangers regarding children’s safety. 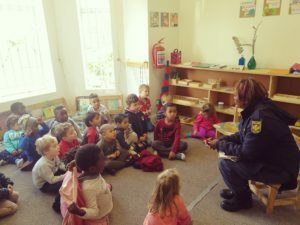 It was also very relevant for the little ones to learn some useful tips on what to do in certain unfortunate situations, like; getting lost in the mall, having strangers approach them, keeping safe at the park etc. The children also got the opportunity to ask some questions that were of significance to them.